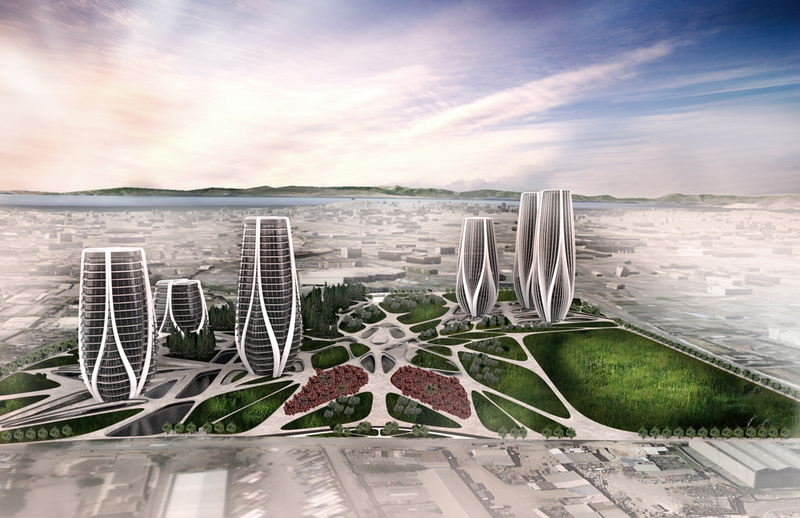 Athens Vision is a proposal of regenerating 200,000 sqm /50 acres located in Votanikos area. Votanikos is located 3 km west of the downtown part of the Greek capital of Athens. The western part is currently mostly occupied by industrial buildings and old factories. Simultaneously, the Agricultural University of Athens sits in the area while major streets with high circulation are surrounding it. Based on the given site, our young London-based practice Lianou Chalvatzis Architects, propose an urban park, a masterplan which combines residential towers, offices towers, green areas, cultural spaces and retail plazas. Athens Vision consists a prototype typology proposed as a solution to the limited green areas and the dense urban fabric of Athens in general, thus the proposed case could be applied as a whole or part of it, to various areas of Athens relieving the dense urban fabric. The proposed masterplan deals with the creation of a network thus is consists a flexible concept and able to be expanded to surrounding areas and neighbourhoods. 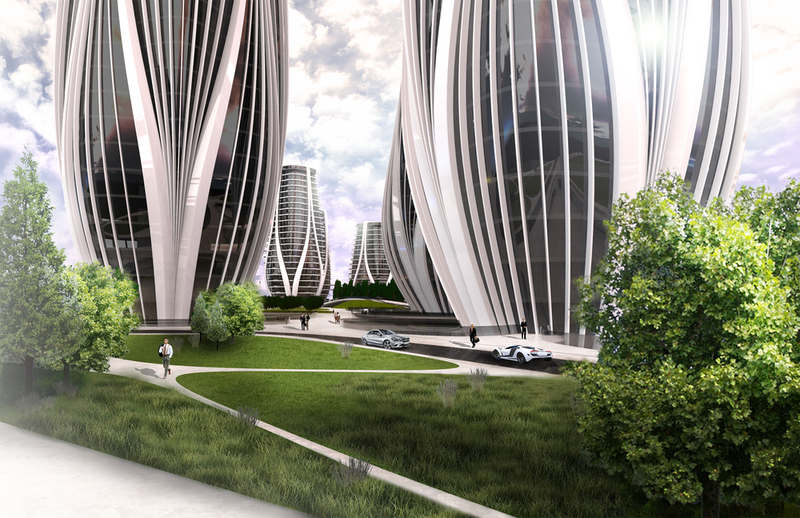 Simultaneously, we propose tall and high rise buildings which release horizontal space from the ground and convert the ground level into green spaces, parks and plazas transferring the heavily built element into the vertical axis providing at the same time incredible views with quality spaces in the ground level. Moreover through skybridges and connections of the towers between them, roads and circulation can continue to flow expanding the city into multiple layers and offering quality spaces and experiences to the citizens and visitors of Athens. We create a network of hard-scape which defines multiple green area/cells. 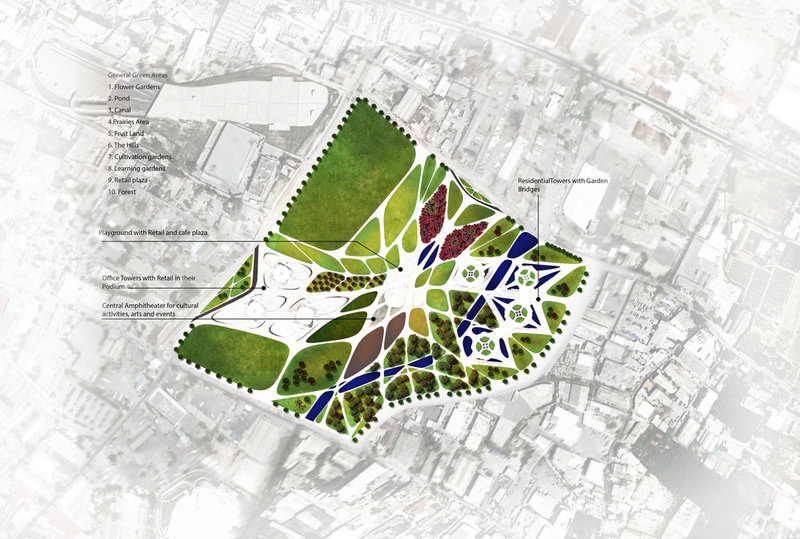 The masterplan is divided into thematic parks, where one or more cells consist the various qualities and atmospheres which are ranging from the flower gardens, the pond, the Fruitland, the Prairies, the Hills, the Forest, the cultivation gardens and the retail plazas while in the central area there is the Amphitheatre where cultural activities, arts and events can take place. Each thematic area is creating a different experience and quality while by introducing learning and cultivation gardens, we stimulate the neighbouring Agricultural University of Athens to be part of it and interact, teach and communicate with the society. 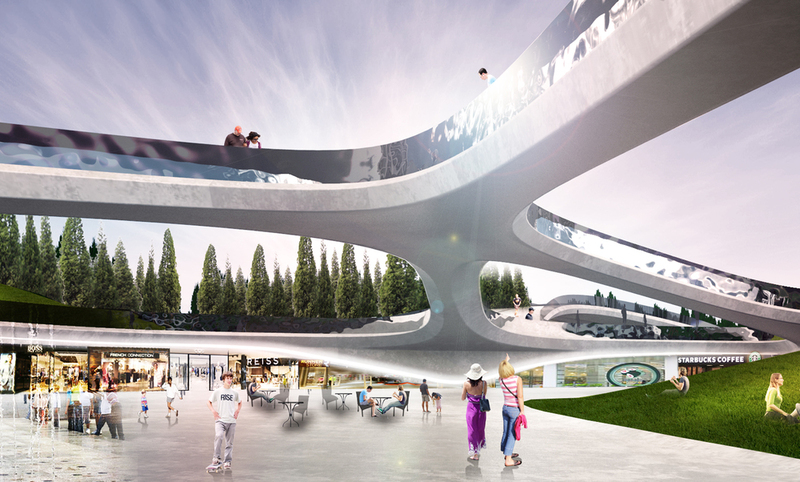 The urban park is developed in multi-layers where the visitor can experience the park from various points of view since the landscape and the plazas and amphitheatre blend in height with the pedestrian routes and the bridges, through smooth transitions in height, proposing a total embedded architecture into the landscape. In that context, the retail areas are deployed based on two typologies. Either the ‘Hill’ or the ‘Crater’ typology, where in the first case the ground peels off and accommodates the retail inside or in the second case the cells dips down creating a crater typology, where the retail is accommodated underneath the pedestrians network. Simultaneously, the masterplan accommodates in the west side four residential towers and on the east side three office towers varying from 50m to 152m. The structural system of the towers is based on the exoskeleton, while the massive typology of it, is adapting to the Greek reality, culture and environment through the introduction of balconies, while the slabs act as shading device in the north and east side of them. The office towers follow as well the same structural system of exoskeleton, while instead of balconies they have vertical louvers. The exoskeleton of the tower is consisted from hollow pre-fabricated elements of concrete which are transferring the water from the roof and the apartments to the gardens, facilitating the watering system while they enhance the environmental aspect of the project. Furthermore, the residential towers on the west side of the masterplan are connected with skybridges, creating social gardens and areas for the residents where they can cultivate their seeds for their own use, while on the top floor of the towers there are gardens and areas where the residents can relax with clear view of the Parthenon, the sea and the sky. 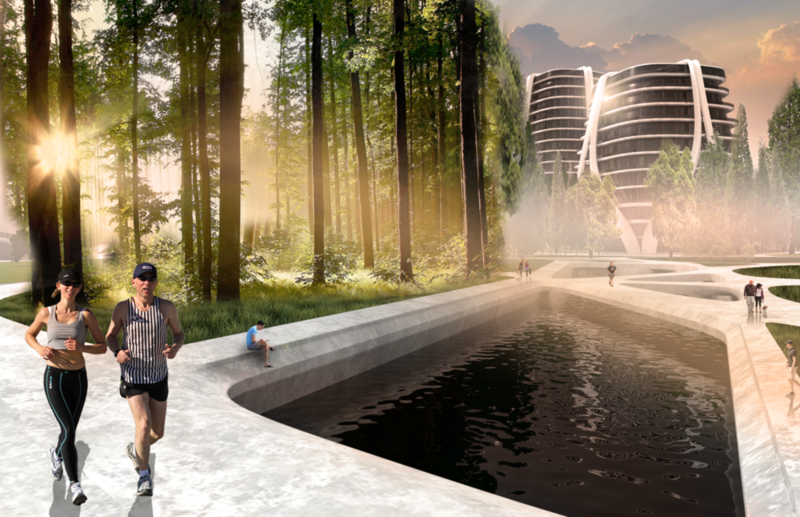 The residential towers sit on ponds of water isolating them from the noise of the park and creating a more relaxed and independent condition, while visitors and residents enter the towers by bridges over the water. On the other hand the office towers sit on retail craters where people who work in the towers can access directly the cafes and restaurant located in the -1 and spend their interim time in the crater plazas or visit the top floor of the office towers where there are more exclusive restaurants and cafes with view of Athens’ urban fabric, the Acropolis and the coastline.